Apply coupon code at checkout to enjoy 10% off your entire order at World Market. Exclusions: alcoholic beverages, gift cards, eGift cards, CRAFTY BY WORLD MARKET merchandise. Save 10% on framed art, mirrors and wall decor at World Market with coupon code. Click on the "Redeem Now" button to go to the page with eligible items. 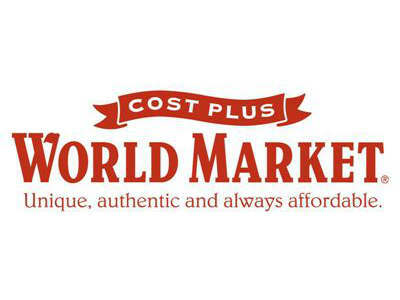 Apply your coupon code to enjoy 10% off your next purchase when you sign up at Cost Plus World Market! To visit Cost Plus World Market online site, click "Redeem Now". Use the coupon code to enjoy free shipping on orders $150 or more at checkout from World Market. To view the online site of World Market, click "Redeem Now". Shop now! You could get 25% off on the following goods at World Market: all storage baskets, all open-stock flatware, table linens (excludes buffet napkins), all open-stock dinnerware, all wine racks, all open-stock glasses and get 50% off on all dining furniture & decor, including chairs, tables, flatware, dinnerware, and more! Besides you could also save an additional 10% with the coupon code at checkout from World Market. Click "Redeem Now" to enter the online site of World Market. Save 10% on your entire order at World Market sidewide with this coupon code. Exclusions: alcoholic beverages, gift cards, eGift cards, CRAFTY BY WORLD MARKET merchandise. Use the coupon code to enjoy free shipping when your purchase $150 or more from World Market. Enjoy free shipping with this coupon code when you purchase $175 or more at World Market. Receive 10% off sitewide with your purchase at World Market with coupon code. Exclusions: alcoholic purchases, gift cards, eGift cards, CRAFT by World Market merchandise, delivery surcharges, and shipping fees.